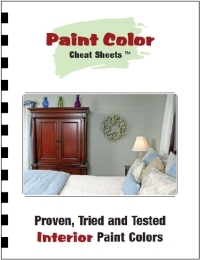 Your sleep style should be a major consideration when shopping for bedroom paint colors. Have a hard time going to sleep at night? Choose soothing neutrals or cool shades of blue, green, or gray. If you just don’t want to get up in the morning, warm earth tones and cheerful bright shades, like yellow or red, can give you a boost. If you share your bedroom with another person, you might have to compromise. Don’t worry. It’s easier than you might think! 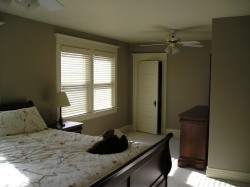 Relaxing bedroom paint colors include neutrals and most cool colors. Neutral doesn’t have to be boring! Any shade that goes well with most other colors is considered a neutral. If you’re having trouble, think about your wardrobe. White and beige go with everything- but so do black, brown, gray, khaki, silver, gold, and navy. Very dark colors can make a room look closed in. Save these for furniture, pillows, and other accessories. Metallic paint, in small amounts, can lend a luxurious look. Stick to trim and accent pieces though to avoid a tacky appearance. Cool colors include blue, green, and purple. In warm climates, these colors can actually make you feel cooler, and since our body temperatures naturally drop during sleep, this can promote a restful feeling and help you nod off faster. Avoid bright, heavily saturated colors if you have trouble relaxing. Instead, search out a color with gray, brown, or black undertones. More energizing bedroom color schemes include vibrant colors, like yellow, orange or red, and warm earth tones. Try terra cotta paint and tone it down a bit with a chocolate brown comforter. It’s hard to get out of bed on the wrong foot when your room is decorated in sunny yellow with crisp white accents. Or, create a sumptuous love nest by combining rich red walls with gold and black accents. To create a comfortable environment for both sleepers, use a khaki paint on the walls and choose a saturated olive green for trim and bedding. Then, add a cheerful pop of color and visual interest by adding in paprika or burnt orange throw pillows and knickknacks. Another solution would be to combine pastel yellow walls, white ceilings, and a blue and white quilted coverlet. The subtle yellow makes helps emphasize natural light in the morning, but doesn’t provide a shocking distraction at night. Kid’s rooms can be tough to decorate. For one thing, kids spend more time playing and hanging out in their bedrooms than actually sleeping. It’s important to strike a balance between being restful enough to promote good sleep habits and being appealing enough to spend time in during the day. For another thing, kids grow, and their tastes change rapidly. Your four year old girl might love pepto pink now, but in a few years it will be overwhelming. If your son’s favorite color is blue, a bright sky blue might be your natural choice. As he gets older, though, he might prefer navy. The solution is to paint the walls subdued shades of their favorite colors- petal pink for Suzy, and a soft gray-blue for Bobby. Then go wild with accessories, choosing shocking pink and purple pillows, blankets, and curtains for a girl’s room and a denim quilt and stick-on ocean decals for a boy’s. You can even use furniture as an exciting accent; just apply a quick coat of spray paint. These small details are easy to change as your kids grow, and you won’t have to find a home for all their stuff and make them sleep on the couch while the transformation takes place. Play it safe with guest bedrooms. Have you ever noticed that most hotels are decorated in neutral colors? This is because a neutral color scheme is virtually appealing. You want your guests to feel at home; that means keeping your color preferences out of the room. Just because a room is painted in neutral colors, though, doesn’t mean it has to be boring. Use textured paint to add subtle interest. Another option is to paint wide stripes on the walls. Use the same color, but paint half the stripes in a semi-gloss finish and the other half in a flat finish. Faux finishes also add interest. Start with a light base, wipe on a darker glaze, then sponge most of it off and let it dry. Consider a hand-painted border of vines, or a heartwarming inspirational quote. Or, add paneling to the bottom half of the room. It can be painted the same color as the rest of the wall, or a contrasting shade. Try white paneling against a brown wall for a crisp, modern feel; combine it with a soft gray for a beachy effect; or choose molded paneling designed to look like carve plaster, and pair it with a soft gold wall for Victorian appeal.